What feeling would you like your home decor to create? And then, what feeling does it have at the moment? Those are two very different questions, but I think you have to entertain them both to begin to move from one point to another. Is your home a mishmash of styles, colors and attitudes? Maybe that eclectic look makes you feel alive, or maybe you'd like to edit, to simplify. Does your home as a whole have a style - your style - or do you prefer to reinvent it room by room? I don't know if that's a weakness or a strength, but I decided to put it to work for me with Stitched Holiday. I thought it would be fun and useful to make projects in distinctly different color palettes to show how to use color to create a holiday mood. After all, with Stitched Holiday you have the opportunity to make several projects for your home all in one go, streamlined projects designed to be simple enough to finish this year. Why not put some intention into your color choices? Choose materials with a particular vision in mind, and you will quickly create a cohesive mood! My first palette, Gumdrop, is straight from my home. Ok, maybe not, since these pictures are not of my home, haha! But, this fun, colorful holiday is the direction I have taken with our tree and decor. Gumdrop doesn't hold to traditional holiday colors. Instead, it's lots of colors with their bright, playful personalities bringing natural holiday cheer. It's young, slightly retro, very inclusive. Notice that most don't include all the colors, but used together in a space they bring that cand-colored joy. The Zigzags in the Round Tree Skirt is a great opportunity to use all the colors at once, pulling everything together. I especially enjoyed bringing the Gumdrop palette to my Evergreen pillow. A subtle sprinkle of brightly colored beads dials up the fun on this wool applique tree. You can't see here, but the surrounding and pillow backing fabric is a Cotton & Steel metallic with shimmer (available as a kit at The Confident Stitch). This palette is quite the opposite. It feels rich, yet simple; elegant, yet understated. With a cultivated selection of cool, earthy hues, Mistletoe creates a luxurious holiday atmosphere. 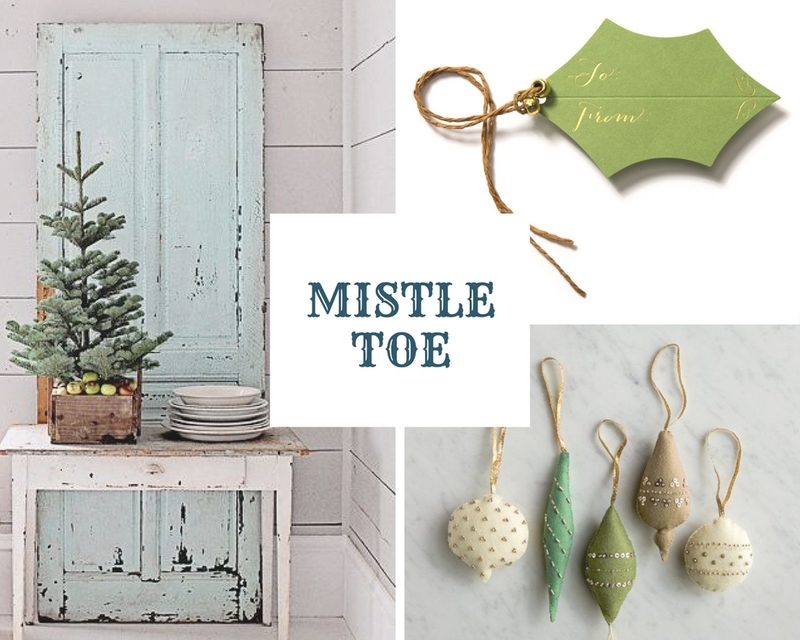 Mistletoe is well suited to decor styles from traditional to midcentury. To succeed here, you simply narrow your choices in color and pattern to let the lovely details shine through. Did you notice I made the Countdown Calendar in both colorways? And the Stockings and Evergreen Pillow too? It was exciting to see the projects take on a whole new life with a distinct palette shift. I'm looking forward to your interpretations too! Are you inclined to follow my lead? I've partnered with The Confident Stitch to make project kits available for select projects to recreate Gumdrop or Mistletoe with ease. Enrollment opens on Sunday so you can start planning your projects. Next week only, students receive Free Shipping on any order from The Confident Stitch, including class kits and specialty fabrics and notions (melton wool, canvas, pompom trim, zippers, metallic thread, wool felt and more). Get the extras you need in one handy stop! When you register for Stitched Holiday you'll have instant access to the shiny, new course platform, where you can also download a complete project and supplies list with resource links. You'll find the Free Shipping coupon for The Confident Stitch there too. I've done the work to make your planning and shopping a snap. So, enjoy your weekend! Soon it'll be time to start our Stitched Holiday and breathe a fresh new life into our winter season at home!